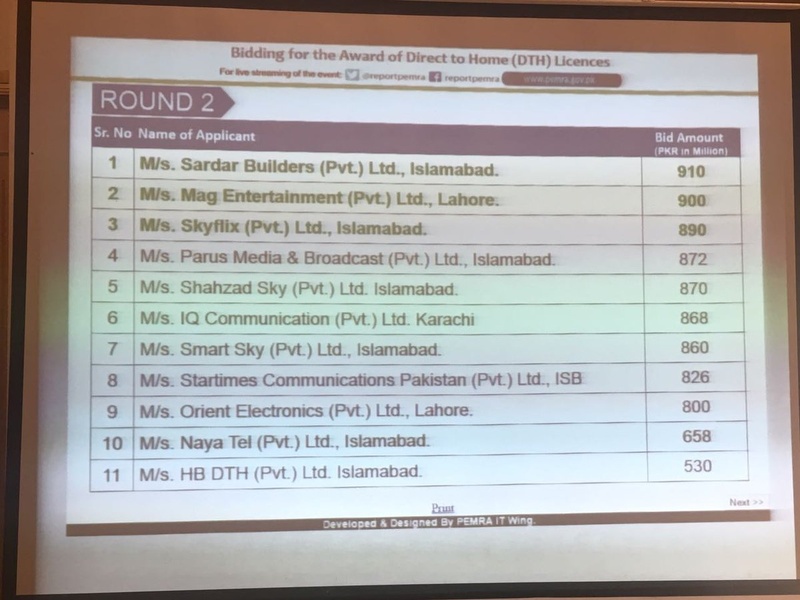 Pakistan Electronic Media Regulatory Authority held bidding for auction of three DTH licenses today. Successful bid was announced at Rs. 4.898 billion for single license. All three winners will get DTH license for this same amount. PEMRA, as a whole, will bag Rs. 14.694 billion as a result of this bidding. 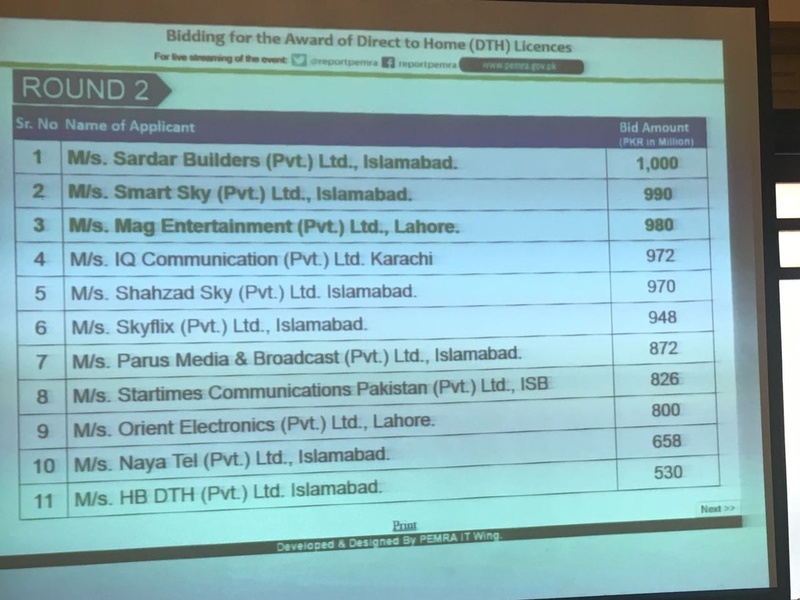 Process had started DTH bidding after Supreme Court issued a short order allowing it to hold the auction. Apex Court, however, said that outcome of bidding will be conditional with High Court’s detailed order. Congratulations to all winners. Great efforts by PEMRA for not stopping bid. 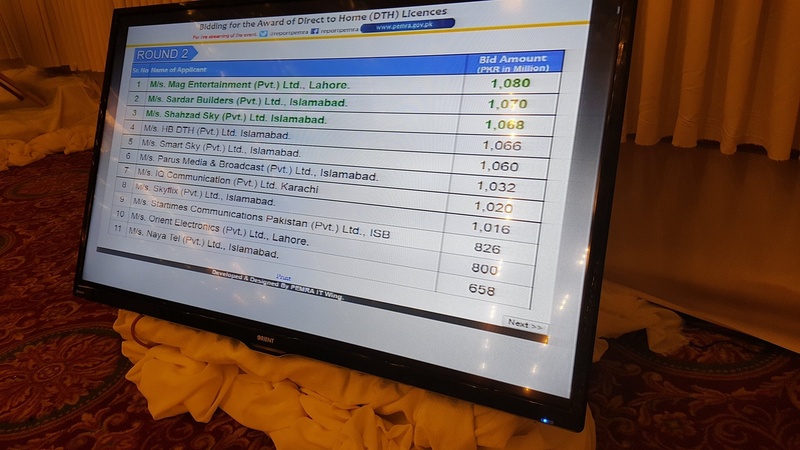 This continue bidders momentum and faith on Pakistani DTH. BTW I will go with Startimes DTH and will check their internet as well. A Very Reasonable Reply to PBA Notice. Business Plus is associated with Daily Times. Cable wale Kanjron ne phir cable band kar di hai. Socho kia karna hai inka. ji bhai bikul zabardarst but I fear ke jitna mehnga sale hoga license utna hi expensive hoga DTH for end-user. Itne paise koi bekar main invest thodi karega, yeh sab clients ke jaib se hi nikalna hai. Honourable Supreme Court of Pakistan has announced in favour of PEMRA. Historic DTH Bidding will start shortly in Islamabad Marriott. Pba said they will not allow to broadcast their channels on pakistani dth. Indian money speaks. If an indian dth starts broadcasting PBA channels they will be more than happy . Mark my word in two years time PBA will beg to allow them to be part of pakistani dth. PBA and cable operators are working against the tide (technolgy). Dth and iptv is future. You cannt go against it. Any channels who deny their content going on dth must be suspended for sometime to teach them a lesson. what in DTH which is not in cable !!!!!!!!! so round 1 was won by PTCL AKA SMART SKY? Me too !! Their services are awesome !! Please clear what will happen to cable operators will they still work and what is the procedure to install DTH at home or office. Thank you. Bid crossed Rs 500 million(PKR) & going up. Love Nayatel Service, but would be nice to have new players in the game as well. So, I am biased against Nayatel, PTCL and any other provider, which is already serving in Pakistan. The only time one would unconditionally support Absar Alam for going ahead with auction. And for God’s good sake, PTCL? Again? Really? Oh God! Nayatel is long long out :(. They don’t stand any way near the rest of the competitors as far as financials are concerned. Nayatel, with its 5 star customer service, should definitely get it. They are best in business. Who is the highest bidder now ? any link for live streaming ? LIVE on #Periscope: DTH Bidding second round in progress. The amount has exceeded 700 million Rs. How many licenses will be given out today? any idea? Good it will right away introduce some competition, so we will have more options, better cost for having one, fast establishment of infrastructure by companies to take a lead. Nice! Bhaiyo Cable Operators Association k liye Ek Minute k liye khamoshi ikhteyar karen. Yep, not exactly the standards set by the 3g/4g auction… But Thank God dth is finally coming… Something is better than nothing… All that’s left is Paypal ? Tell us the current positions man !!! Whats the difference between round 1 and round 2? Why round 1 amount was so low and how come PTCL have won that? 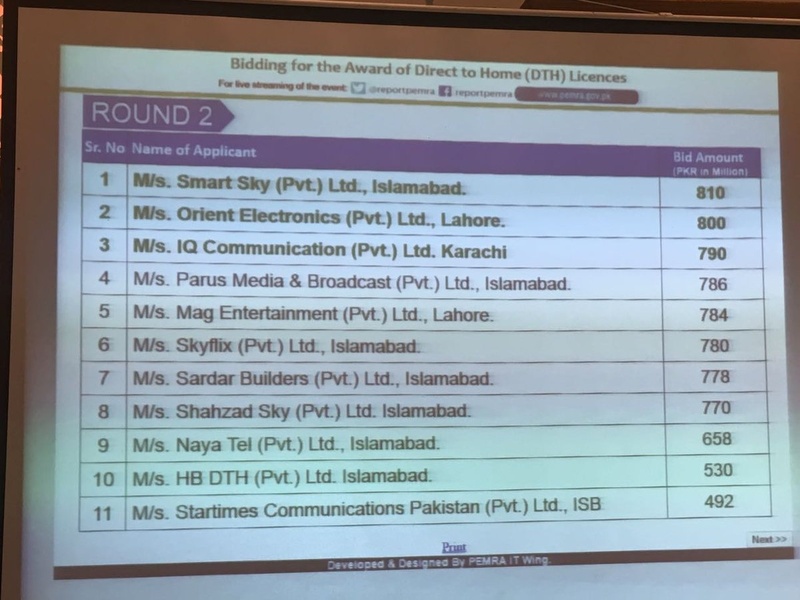 DTH Bidding second round in progress. The amount has reached 1 billion PKR. where can i find this live table .. online?